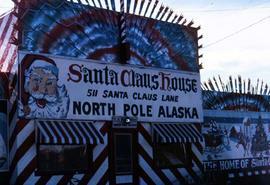 "Santa Claus House, 511 Santa Clause Lane, North Pole Alaska"
Colour Ektachrome 35mm slide depicts a sign for the 1st National Bank in Fairbanks, Alaska. 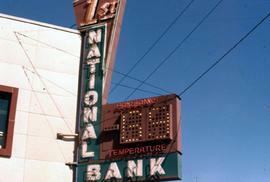 In addition to the name and location, the sign also records the temperature as "-69. "Note: Colour adjusted on JPEG. Colour Kodachrome 35mm slide depicts Airport Traffic Control Tower at Fairbanks International Airport. Colour Kodachrome 35mm slide depicts the Brooks Memorial Mines Building, part of the University of Alaska in Fairbanks. Colour Kodachrome 35mm slide depicts a building designated for Wien Alaska Airlines.Note: Brightness adjusted on JPEG. Colour Kodachrome 35mm slide depicts a circular building. Colour Kodachrome 35mm slide depicts a close-up of a ship called Galena.Note: Brightness adjusted on JPEG. Colour Ektachrome 35mm slide depicts a street with pedestrians, in downtown Fairbanks, Alaska.Note: Colour adjusted on JPEG. Colour Ektachrome 35mm slide depicts the Federal Building in Fairbanks, Alaska.Note: Colour adjusted on JPEG. Colour Kodachrome 35mm slide depicts a girl holding a puppy.